The re-mastering of the Paper Print Collection from the Library of Congress is certainly one of the most unique projects in Film Preservation today. This work is being handled by the Library's Motion Picture Conservation Center at Wright-Patterson Air Force Base in Dayton, Ohio. Under the direction of Ken Weissman this material is given new life. This collection is comprised of paper copies of film produced from the period of motion pictures infancy from 1894 to 1912. These items were submitted to the U.S. copyright office as a means for copyright registration. It is generally agreed that the first successful projection of motion pictures took place in the mid 1890's. At that time film was only a novelty and had yet to become the multi-million dollar industry it is now. There was no way for someone to legally protect the films they had created because there was no provision in copyright law for motion pictures at that time. However, it was known that there was protection for still photographs. W.K.Laurie Dickson who was one of Edison'sChief Engineers produced a copy of film on a paper roll and submitted this to the Copyright office under the still photo category to receive protection. Dickson had some experience in this area as he had already received copyrights for some photo'she had taken of Edison. The first listed receipt for film copyright is by Dickson on January 7, 1894 for a film titled "Edison Kinetoscopic Record of a Sneeze" . This is now known as Fred Ott'sSneeze named for an Edison worker who was recorded in this activity. This was the method used for copyright registration until copyright law was amended to cover motion pictures. These "paper prints" arrived in many forms. Some studios sent in a copy of the complete film, others sent small sections of each different scene, and still others sent in only a few frames of the entire film. Just what is a "Paper Print ?" Basically, Paper Prints are a contact copy of a motion picture produced on a light sensitive opaque photographic paper. The printed rolls were the same size and width of the motion picture film. In some cases these "Paper Prints" contained perforations, but in most cases they did not. For many years this material was put into storage at the Library of Congress just like a majority of other material of this period. There was no reason to believe that these rather unusual paper artifacts would have any value other than the original intent, as records of copyright registration. Nowadays it is a well known fact that approximately 90% of films made from this era are unavailable. The reasons are many. In some cases neglect was the cause, the primitive projection methods of the day also played a part in the films demise, and some studios destroyed their own films once they felt they were no longer profitable. However the biggest cause would be the self destructive nature of nitrate film itself. 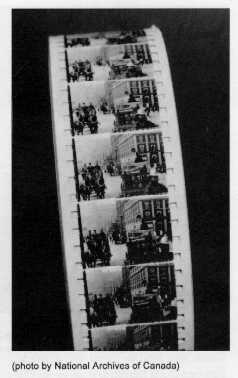 In the 1930'sat the beginning of the movement to create film archives we became more aware of the potential loss of a large segment of film history. The motion picture industry and specifically the film manufacturers had been aware from the earliest days of some of the inherent problems of the nitrocellulose film stock. First and foremost nitrate film was extremely flammable. However , at that time there were no viable alternatives to this film base. In those days the only major concern was the flammable nature of this film. It became increasingly apparent that due to the chemical instability of nitrate that it was beginning to decompose at an alarming rate. So much so that a large body of work made in the early days of cinema was already in such a state that it was no longer available for viewing. One of the first preservation pioneers was Mr. Howard Walls. In the late 1930'swhile working for the U.S. Copyright office he rediscovered and became interested in the potential of the paper print material. Mr. Walls first efforts were to catalogue this material, and by the mid 1940'ssome attempts had been made to reproduce this collection onto a film base. Carl Louis Gregory of the National Archives Motion Picture Division had developed a printer to handle old and shrunken film. 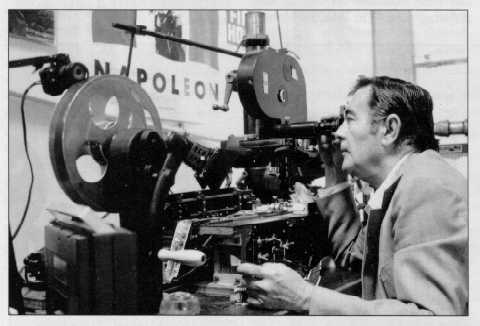 By modifying this printer to utilize reflected instead of transmitted light Mr. Gregory was able with limited success to transfer this material onto a motion picture base for projection. In the mid to late 1940'svarious groups including the National Archives, Richard Fleischer of RKO/Pathe and the George Eastman House made attempts to copy this material. It wasn't until the early 1950'sunder the direction of Kemp Niver that this collection was filmed on a consistent basis. Mr. Niver went about preserving and preparing the paper prints to be copied with a printer and printing process he designed to transfer the collection onto 16mm film stock. For his efforts Kemp Niver was awarded an Academy Award in 1954 in appreciation of his preservation of the Paper Print material. While his work was admirable, especially considering the available technology of the time his results were uneven. One of the major problems he encountered was maintaining a stable image, this was a result of having to essentially hand register each frame. Over the next decade Niver worked to transfer the 3000 or so films he listed onto 16mm film. In the mid 1980'sthe LOC entered into a contract with the UCLA Film and Television Archive to remaster this material onto 35mm film stock. UCLA utilized the services of Bill Ault who worked with Kemp Niver on the original conversion project. He had at his disposal one of the 2 printers Niver developed. This printer modified to handle 35mm film stock as opposed to the original 16mm. Mr. Ault would re-photograph this material and send a process negative to the Library of Congress and the library would then take responsibility for having fine grain masters and the other required prints made. Unfortunately the same problems that were inherent in Mr. Nivers project resurfaced here, mainly the ongoing problem with frame to frame registration. In the later 1980's the contract with UCLA expired and Mr. Ault retired. The Library of Congress began to explore alternatives to keep this project going. The Library was able to secure under a permanent loan arrangement the printer Kemp Niver Donated to Ohio State. At first glance it seemed that the Niver printer could be modified to handle this project, but it became apparent that the image registration problem could not be overcome on this printer. At about the same time the Library was involved in a project to produce some of the Edison Paper prints onto Laser Disk. 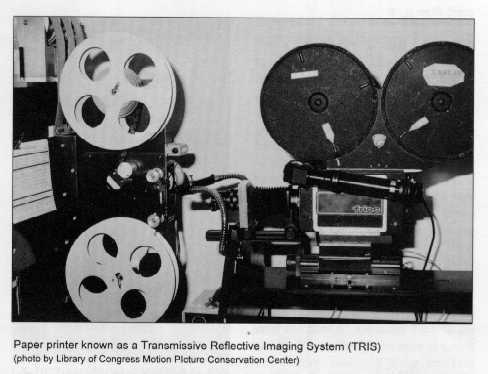 They received a printer named the TRIS (Transmissive Reflective Imaging System) and it was able to produce quite steady images, however it had the flaw of producing a soft image. It was decided that this apparatus could be utilized for the 35mm remastering effort. One of the main modifications to this printer was to change the aerial image lens to a printing Nikor lens. This is specially designed for printing flat images . The TRIS is controlled by a series of stepper motors that advance each frame of the paper print (mounted on reels) at a predetermined distance. The image itself is illuminated by a set of fiber optic cables that produce a consistent yet cool light source. This image is split and routed to the 35mm camera that is part of this Printer and also reproduced on a video monitor. Once the first frame is viewed the video monitor is marked with a grease pencil for registration points of the frame. When the first frame is set up one frame of 35mm stock film is exposed. The next frame is moved into position and "fine tuned" into place by use of computer keyboard controls. This is done for every frame of the film. Using this method approximately 100 feet per day can be completed. It was also discovered the paper prints containing edge perforations could be remastered using an ACME optical printer. The recent restoration of the 1915 film "The Italian" was handled by using this process. One of the critical aspects of the remastering effort as mentioned before is the issue of frame to frame registration. The best way to describe this would be to imagine you have 2 identical frames of a film and were to overlay them one on top of the other the top, bottom, right, and left would all be perfectly aligned. When this is done in a film you get a very smooth steady image when projected. However, if any section is not aligned then that image becomes very jittery and unstable. In the earlier efforts to film this material various manual attempts were tried as at that time that was the only process available. At best the results were inconsistent. The improvement provided by use of the computer controlled TRIS is remarkable. The film is then processed and inspected. The L of C has in place its own lab for black and white processing. Once the negative is finished and inspected it is sent to have a fine grain master made for archival preservation along with 2 fully timed prints. These prints are viewed and inspected to make sure they meet the high standards the Conservation Lab has worked to maintain. Currently there have been approximately 150 to 175 titles re-mastered onto 35mm. The listed size of the collection is about 3000 pieces which means at this point only about 5% of the collection is complete. At the present time the Library of Congress has adequate funding to complete 400 to 500 titles. It is hoped that additional preservation sponsorship can be obtained to complete this unique restoration project. What has made this program unique ? This project required the development of a new computer assisted registration technology. It is hope that this device can be utilized on more traditional film preservation projects in the future. The paper print collection represents an absolutely unique group of moving image records documenting not only this country at the turn of the century, but in many cases the world as well as the development of the motion picture industry. The new 35mm high resolution images being produced at the Motion Picture Conservation Center in Dayton is the culmination of an exceptional and unique preservation effort. This work and these images should be recognized and celebrated to ensure that this important project will be completed. *This article appeared in the AMIA (Association of Moving Image Archivists) Newsletter, issue number 36 spring 1997. ©1997 Cannot be copied or reproduced without permission of the author or the Association of Moving Image Archivists.